March 04, 2014 Culture » Big Shiny Robot! If you’ve been awake at all in the past decade, it should come as no surprise that comic books are being adapted left and right, into every sort of medium you can imagine. They’ve had cartoons locked down for decades, the biggest recent summer movies are all comic properties, and a growing crop of television shows are showing a lot of spandex and capes. In one sense, television seems to be a much more natural medium for comic-book adaptations than feature films. By their nature, comic books are serials, each ending in a cliffhanger until the next monthly installment. And the weekly format of television matches that style of storytelling the best. It’s plain to see that there are characters where TV just works better. Take The Incredible Hulk, for instance. With Ang Lee’s theatrical adaptation and Louis Letterier’s sequel, there was no matching the charm, tension building and long-term character work of the 1978 television series starring Bill Bixby and Lou Ferrigno. DC Comics and The CW have been building up Oliver Queen’s quest as the Emerald Archer in much the same way on the show Arrow, taking the time to juggle long-term storylines in tantalizing snippets, just as the best comic-book storytelling does. There’s no denying that the serial format, mid-season breaks and cliffhangers of The Walking Dead, ripped straight from the pages of the comics, are suiting that property much better than a film—or even a series of films—ever could. 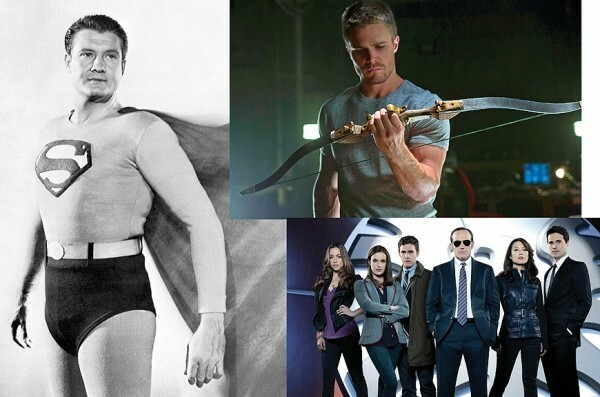 Yet television, it has now become clear, isn’t the only place to tell ongoing superhero stories. At the moment, the leader in the serial storytelling game is Marvel Studios. One of my favorite things about comic-book universes is the shared history and space they occupy. There are hundreds of supporting characters who can pop in at a moment’s notice, crossing over into other books to tell the best stories possible with characters we’re already invested in. For the longest time, that’s been impossible on the silver screen. Movies featuring any superhero character were limited to just that character. But Marvel has turned all of that on its ear, making the entire Marvel Studios universe a shared one. Captain America can have a cameo in the Thor sequel, which would have been unthinkable a decade ago. The Avengers isn’t just a team-up that we hope for; it actually happened. And the post-credit sequences link to the next story in a way you would only find with comics. Since the end of the first Avengers picture, they’ve been building a huge story: Thanos and the Infinity Gauntlet, one of the most epic showdowns in comics history, featuring consequences for every single person in the Marvel universe. Just thinking about it raises the hair on my arms. And Marvel’s upping the ante even further by tying the cinematic universe into the television universe. At the moment, all we have is Agents of S.H.I.E.L.D., but Marvel has teamed with Netflix for a plan to bring us four other characters in a serialized format, including Daredevil and Luke Cage. These are characters who, once included, can step into the big crossover events at their leisure—and that’s good for everybody. Superheroes are taking over every screen you watch. And the way the stories are unfolding will keep us coming back for more.